Eltronicschool. - This is freeware electronic software to performs electronics-related calculations that called with Electronics Assistant. 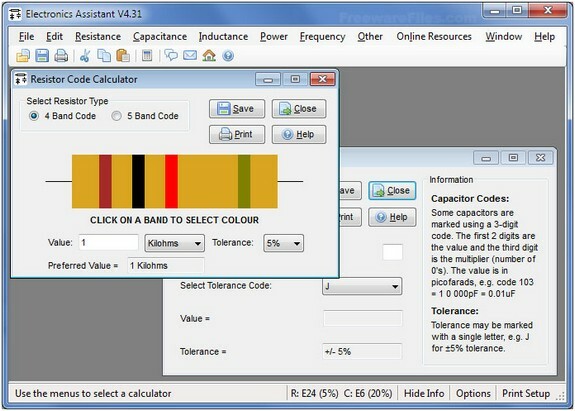 So, with this software you can calculate any electronic component like resistors, capacitors, and power. In this time we will give you global information about Electronics Assistant, and then we will give you link to take free download Electronics Assistant v4.31 for Windows from external server easily. According Freewarefile site describe that Electronics Assistant is a Windows program that performs electronics-related calculations. It includes a resistor color code calculator, resistance, capacitance and power calculations and more. Details of calculations can be saved or printed. It provides all the functions found in the calculators section of this site and more in a stand-alone user friendly program. And now you can click link below to take free download Electronics Assistant v4.31 for Windows from external server esaily.